Come experience the Fall Oyster Crawl and you too will agree that “Virginia is for Lovers”… of wine and oysters! Join the wineries of the Chesapeake Bay Wine Trail for our 6th Annual Fall Oyster Crawl on Saturday & Sunday, November 10 and 11, 2018! Virginia is quickly becoming known as the “Oyster Capital of the East Coast” and November has been named “Virginia Oyster Month.” A great way to enjoy the experience is with local wines & oyster pairings along the Chesapeake Bay Wine Trail – voted the #2 Wine Trail in Virginia by the readers of Savor Virginia Magazine. Each participating winery will be offering one or more delicious oyster dishes to pair with its wines. Several wineries will also feature live music. Tickets are not required for this event. 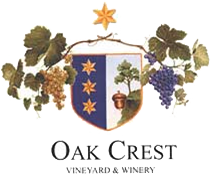 Normal wine tasting fees will apply at each winery and oysters will be available for purchase at market rates. Wines will be available by the glass or bottle. 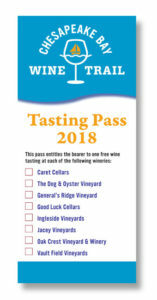 Purchase a limited-edition Tasting Pass at one of our member wineries to save on tastings throughout the Trail. 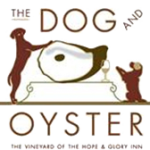 Menu: Oysters on the Half Shell; Roasted Oysters in 3 styles (Rappahannock, Low Country and “N’Awlins”); Fried Oysters; Fried Oyster Po’ Boys and Sliders. Plus, Crab & Shrimp Bisque and Grilled Italian Sausages. Menu: Raw Oysters, Fried Oysters and Oyster Tacos prepared by The Great Wicomico Oyster Co. Menu: Oysters on the Half Shell, Fried Oysters and “Oysters Denson” (grilled with seasonings and topped with Parmesan cheese), all prepared onsite by the R&B Oyster Bar from Denson’s. Other menu items will include Denson’s award-winning Crab Cakes, as well as Cheese Platters and Chocolate Eclairs. PLUS, Live music in the courtyard from 1-4pm on both days (Saturday: Karen Jonas; Sunday: The Lewis Sluder Smith Acoustic Trio). Please note: Jacey will participate on Saturday, November 10th only. Menu: Byrd’s Seafood Co. will serve Raw and Roasted Oysters on the Half Shell, Fried Oyster Taco’s and Byrd’s Signature Oyster stew with collard greens, country ham and sweet onions. Live music will be performed by Mercy Creek. RULES: VA sales tax of 5.3% will be added. Must be at least 21 to purchase and taste; valid ID required. Not responsible for lost or stolen passes. Pass expires on December 31, 2018. Our wine trail is conveniently located within one to two hours’ drive from many surrounding cities, such as Fredericksburg, Norfolk, Richmond, Washington DC or Baltimore. Whether for a day trip or an overnight stay, there are many options for exploring our trail. 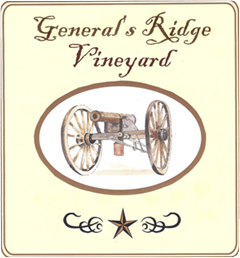 You can view an interactive map of our Trail wineries on our Homepage. If you are interested in arranging transportation for a group, you can find some of our Transportation Partners on our Itineraries page. The Chesapeake Bay Wine Trail was voted the #2 Wine Trail in Virginia in 2017 by the readers of Savor Virginia Magazine. Learn more. The Chesapeake Bay Wine Trail was voted the #1 Wine Trail in Eastern Virginia by the readers of Virginia Living Magazine in 2013. Today is World Malbec Day! Did you know you can get it right here in Virginia at Trail winery Jacey Vineyards? Join our email list to stay informed about wine trail news and events. 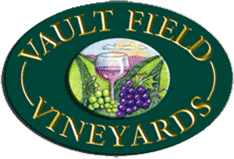 Visit our winery tasting rooms to get a FREE official passport and staff will validate your visit with a “stamp”. Collect stamps to receive up to 15% off wine purchases.